In the United States the average size of new single family homes grew from 1,780 square feet in 1978 to 2,662 square feet in 2013, despite a decrease in the size of the average family. The tiny house movement is an architectural and social movement that advocates living modestly in small homes. In addition to costing less, small houses encourage less cluttered, simpler lifestyles while reducing ecological impacts. The tiny house movement is growing, with several television shows dedicated to building tiny houses and international attention on CNN, AP, Guardian, Huffington Post, NBC, Oprah, PBS and so many more. Over a two year period, the teams must design and build a Tiny House on Wheels between 100 - 400 square feet. These houses will be built to RV industry standards, must meet the competition requirements, and perform to the standards of each individual team. Judging will be based on Architecture, Energy, Home Life, and Communications. The teams will showcase their house on October 15, 2016 at Cosumnes River College in Sacramento for judging and public tours. Winners will be announced and presented with prizes during the showcase. Santa Clara University undergraduate students have come together over the past two years to build a tiny house filled with big amenities and comfort. The 238 sq. ft tiny house is a fraction of the size of a traditional house, yet it is constructed to meet our audience's needs in a sustainable way. We have designed the rEvolve House as a short term, low cost housing solution for Operation Freedom Paws, a non-profit organization that prepares veterans to train their own service dogs. The tiny house provides the first step in the journey of empowering veterans to evolve their independence and is a safe haven for them to acclimate and begin training their dogs prior to returning to their respective homes. The architecture of the home is designed around a coastal contemporary theme that will provide a calming and accommodating environment for any disability that the veterans may face. All aspects of the home are dog friendly in order to enhance the quality of life to both the veteran and his or her service dog. The house features a bedroom with a Murphy bed and a full sized kitchen that incorporates a seating area and fold out table. The home will also contain a 35 sq. ft wet bathroom with a dry-flush toilet that will eliminate the use of a black water system. The walls will be constructed with Structural Insulated Panels, which will make our house stronger and more energy efficient than a traditional stick framed home. The rEvolve House also features an accessible roof deck that provides an expanded seating area for six. In order to support an off-grid lifestyle, the house is powered entirely by eight 330 Watt Sunmodule solar panels. The house stores its energy using saltwater batteries, the only batteries in the world to be Cradle to Cradle certified. In order to improve the home's solar efficiency by 30%, the house’s trailer will be connected to a Colossun solar tracking ring allowing the entire house to revolve as the sun moves across the sky. The team is partnering with Operation Freedom Paws (OFP), a non-profit organization that pairs dogs with veterans and others who have a variety of physical, neurological, psychological or mobility needs. The individuals and their dogs are trained and then certified together as a service dog team after participating in a 48-week program. Following the competition, OFP will receive the house to act as temporary accommodations for out-of-town visitors who need to stay at OFP’s facility for several days. Potential types of visitors include new clients being paired with a dog, dog shelter workers receiving training on what to look for in potential service dogs, or a service dog trainer coming in to help lead classes. The training program also has clients who travel significant distances and need to stay for a few days every month to receive the training they need. Don is a Mechanical Engineering major and an Aerospace engineering minor. As part of the mechanical team, he will be focusing on the Tiny House's HVAC and plumbing systems. He is very interested in sustainability and green technology and is excited about incorporating these factors into the final design. 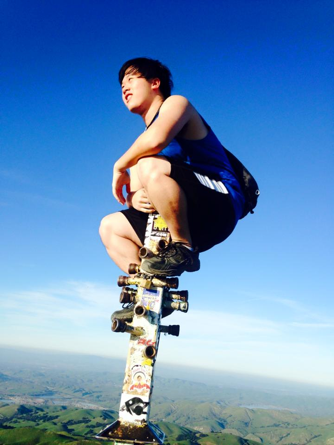 Jonathan (Jon) is a Mechanical Engineering major from San Jose, California. He loves problem solving and working with his hands. He is part of the mechanical team as well as the construction team for the rEvolve house and is looking forward to continuing work on the project. Jun is a Computer Engineering major from Cupertino, CA. He initially joined the electrical team for his passion in sustainable energy and construction projects, but later on took charge during the formation of a new controls team. As the leader of the controls team, he hopes to make rEvolve House more awesome by making it a smart house! Gabriel is a Computer Engineering major from Stockton, California. Gabriel is helping design, run, and maintain the website for the rEvolve team. He’s also a member of the controls team which hopes to turn this tiny house into a smart tiny house. Thomas is currently a double major in Electrical Engineering and Computer Engineering. Thomas is assisting with load calculations and running simulations for the energy load of the house. He hopes to have the house as energy efficient as possible in order to incorporate everyone’s ideas for the house. Kaileen is a Biology and Public Health major who wants to learn more about sustainable energy practices, become part of a team dedicated to innovation, technology, and making the community a better place. She is a member of the architectural team helping lead public relations and communications aspects of this project. Jack is currently a Civil Engineering major. He will focus on the structural design aspects of the tiny house and help with the Revit model. This summer, Jack will be a part of the construction team and hopes to help will all aspects of the tiny house, including those that are not civil related. Brianna is a Mechanical Engineer from San Diego, California. As a member of the rEvolve House team, her work focuses mostly around the wet bathroom design. As a freshman, she thoroughly enjoys learning about the engineering design process and even being able to be part of it. Elena Fromer is a Psychology major and a Public Health and Environmental Studies double minor. She has experience building houses for Habitat for Humanity in the Bay Area and New Orleans. Through the Tiny House project she aims to gain more building and sustainable energy experience. She is currently involved in the fundraising team for the project. Joyce is a Civil Engineering major. She is excited to contribute to the Civil Team's structural calculations, ensuring that the rEvolve house will be as safe as it is fun! She is also eager to learn about the other aspects that go into designing and building a Tiny House. When she is not indoors, she enjoys being outdoors -- though not necessarily trapped in bridges! JJ is a Mechanical Engineering major and is minoring in Aerospace Engineering. He will work on the energy team focusing on thermal analysis and HVAC systems. In a summer internship at a motion systems company, he learned about mechanisms that could be used for multipurpose rooms and storage maximization. He feels qualified to work on the Tiny House because he has lived in a house his entire life. George is an Environmental Studies major and Entrepreneurship minor from Darien, CT. He has experience working with off-the-grid technologies and plans to be a resource during the construction phase of the project. He has a passion for sustainable design and hopes to one day start his own off-the-grid beach house construction company. George will serve as the construction manager for the project this summer. Marcus Grassi is a Mechanical Engineering major. After having returned from an Organic Architecture Internship located in Cochabamba, Bolivia, he has a growing interest and passion for Sustainable/Environmental Engineering. He is currently one of the Mechanical Team Leaders on the Tiny House Team looks to expand his knowledge and skill-set. Anna is a Civil Engineering major. She is working on the structural aspect of the rEvolve house such as creating the Revit model and doing the structural calculations. For the past 6 summers, she has spent time building small houses in the Dominican Republic but is excited to build her first house in the US. This summer, she will be on the construction team for the Tiny House. Mike is a senior History major. He has background in green building and construction and hopes to bring hands on experience into the construction portion of the tiny house competition. He will be working full time over the summer to bring the home into physical reality. He will also be helping the mechanical engineering team, the fundraising team, and the architecture team with various projects. AJ is a Mechanical Engineering major. His focus will be to assist in the design of the heating and cooling systems as well as some of the interior design for our tiny house. Kara is a civil engineering student. As a member of the architecture team, she will strive to incorporate sustainability and renewable as a part of the house to minimize the environmental impact while maintaining the aesthetic nature of the house. Ollie is a Computer Science and Studio Art major. She primarily has a print graphic design background but is transitioning into front end development. She will be helping the team design the Smart Controller UI. Entrepreneurship. He has been working as a media and videographer specialist since the beginning of High School. With his passion for film and a growing interest in Sustainability, James will serve as the video production manager for the project. Matt is a Mechanical Engineering major with a minor in Entrepreneurship. On the mechanical team, Matt is working on the wet bathroom design. He loves creative projects and working with his hands. During his time working on the Tiny House. Taylor Mau is a sophomore studying Electrical Engineering and Computer Engineering. Taylor loves interior design and sustainability. She is currently on both the electrical team and the architecture team and is happy to work on both the technical and aesthetic aspects of the house. Nico is an Electrical Engineering major with an emphasis on power systems and distribution. He has a passion for sustainable energy (particularly solar) and is taking part in ongoing research on bringing solar electricity to rural villages in Malawi in an affordable way. He plans on helping with the sizing of the energy requirements for the house including load and solar panel estimations, as well as the design and implementation of the energy system. He is on the construction team this summer. Nathan is a Mechanical Engineering pursuing a minor in music. He is a Student Ambassador at SCU, a member of the executive board of Tau Beta Pi, and will be spending the summer in Nicaragua designing solar powered water and sanitation systems in developing markets. He is interested in sustainability and hope to study sustainable energy in graduate school. He will be working on the HVAC systems of the rEvolve House. Samantha is currently an Electrical Engineer. She has a passion for both tiny houses and sustainable energy, so she is having an amazing time working on this project. She is currently the lead designer for the architectural development and integrity for the rEvolve House and will be a part of the construction team this summer. Alexander is a computer engineering major from San Francisco, California, born and raised a die hard 49ers fan. He joined Tiny House in order to apply what he is learning to a real world application which also helps veterans in the process. Currently he is helping out different teams like the Civil and Architecture team to help design the house. In the future he is planning on making an application with a coding team in order to automate our Tiny House. Martin is an Electrical Engineering major. He has previously worked on the 2013 Santa Clara Solar Decathlon house and hopes to transfer his knowledge gained from that project to rEvolve House. He plans to contribute as much time and energy as possible to the electrical team and help make the house as efficient and awesome as possible. Sam is a finance major from Concord, California and is part of the class of 2019. He is the current treasurer and is also part of the business team. Sam has experience working in finance and he looks forward to helping the team with its financial goals. He is also very excited about the project and the change that it is creating. Emma is an Environmental Science major in the class of 2016. She is spurring the movement for the team's financial development and is excited to be working on the design and development of the Tiny House. Tim Hight has been at SCU since 1984, and was chair of the Mechanical Engineering department from 1998 to 2011. He has his M.S. and Ph.D from Stanford University, and B.S. from CalTech. His major teaching interest is in mechanical design, and he developed and supervises the senior design project program for the department. Dr. Hight has been the faculty project manager for SCU’s 2007, 2009, and 2013 Solar Decathlon projects, as well as the 2016 Tiny House project. Having assisted in SCU's three Solar Decathlon Projects, Fr. Reites is happy to be working again with Dr. Hight on our Tiny House design and build. Fr. Reites has a joint appointment to Engineering and Religious Studies, having studied Electrical Engineering as an Undergraduate, and enjoys seeing students take the initiative and use what they learn in the classroom.